The Rustler, a common propeller-powered fixed-wing aircraft in Grand Theft Auto: San Andreas. Fixed-wing aircraft, or airplanes, are aircraft that primarily use wings for lift when in motion and propellers or jet engines for thrust. Airplanes were first made available as controllable vehicles with the introduction of the Dodo in Grand Theft Auto III, which was significantly difficult to fly. Unlike helicopters, however, controllable airplanes do not enjoy consistent appearances since GTA III, with Grand Theft Auto: Vice City featuring only one airplane, Grand Theft Auto: San Andreas featuring up to eleven such aircraft, Grand Theft Auto: Liberty City Stories featuring none at all with out a third party mod or cheat device, Grand Theft Auto: Vice City Stories featuring two airplanes, and Grand Theft Auto IV featuring none at all. Airplanes are naturally aircraft that rely on their propellers or jet engines for horizontal speed, generating lift using their wings in the process. Controls while on the ground, however, are often heavy and are only effective at low speeds due to their weight and little traction from the landing gears. As such, airplanes often require a stretch of flat surface in order to take off or land, making the presence of airport runways in games they appear in useful in this regard. The only exception to the rule is the Hydra in GTA San Andreas, which is capable of both conventional and vertical take off, flying, and landing by the simple act of adjusting the direction of its jet thrusters. Since its introduction in GTA III, airplanes possess a wide range of controls: Including working ailerons, elevators and rudders, allowing it to roll, pitch and yaw, and retractable landing gears in GTA San Andreas, which impacts their aerodynamics and speed. In their initial appearances in GTA III and GTA Vice City, certain aerobatic stunts (i.e. barrel rows or loops) are very difficult to execute (likely because the airplanes featured in these games, the Dodo and Skimmer, are underpowered), a limitation rectified in GTA San Andreas, which allows airplanes to perform said stunts and are even showcased during Flying School, where a number of airplane stunts must be executed by the player. The size of airplanes vary greatly throughout the series, with the Dodo and Stuntplane being the smallest, and the AT-400 and Andromada being the largest airplanes and aircraft in general. Airplanes in the series have encompassed monoplanes and biplanes, as well as seaplanes. Initially, airplanes in GTA III and GTA Vice City are relatively resilient to damage, capable of hitting solid objects head on at full speed and sustaining only the same amount of damage a road vehicle may have from a similar crash. Like helicopters, airplanes will also cease to function outright in water if they do not have pontoons (i.e. the Skimmer). GTA San Andreas and GTA Vice City Stories includes realism in the damage engine of airplanes by allowing certain portions of an airplane to malfunction and weaken controls or engine power (indicated by smoke and flapping airplane parts) if they lightly hit an object, and programming the aircraft to explode on impact if flown head on to any solid object or water. If the player flies over any no-fly zone in Grand Theft Auto: San Andreas, such as Area 69, or the Easter Basin Naval Station, heat seeking SAM missile batteries will open fire at the player. When in an airplane, the player will hear rapid beeping that indicates an incoming missile as a warning; the player will also be able to see the position of missiles on the radar in relation to the player's current position, allowing the player to respond with evasive maneuvers. Coding exists in Grand Theft Auto IV that would have allowed the player to fly an airplane, but no pilotable airplane was included in the game. 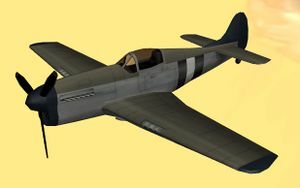 Players can modify the game to enable the ability to fly vehicles like an airplane. Later GTA III-era games and the GTA IV-universe games add realism to the non player-controlled aircraft (i.e. passenger aircraft) by showing them taking off, landing and taxing at the various airports. The opportunity to hijack them, however, is not provided.